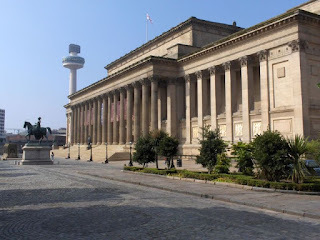 Sunday the 9th of June, saw me back in my favourite city – Liverpool – the city where I was born, went to school, had my first job, and met my husband! Our intention was to walk straight from Lime Street Station down to the waterfront; it was the last day of the Mersey River Festival which has entertained the city’s many thousands of visitors over the last three weekends. However, passing the side entrance to St George’s Hall, we decided to drop into their coffee shop for a caffeine boost first. (Readers will notice how many of these blogs mention coffee shops!) As we’re familiar with the building due to numerous visits over the years, we didn’t intend to linger this time – but we couldn’t help ourselves. It was only 30 minutes or so after the Hall had opened and we soon realised we were the only visitors in the building – even the ground floor coffee shop was deserted. Venturing up the stone staircases to the third floor, we found, to our disappointment, no sign of the quintessential English tea room that used to be there. It was a decidedly eerie experience wandering the building without coming across any signs of life, especially when we walked into the Court Room and found the dock occupied by two life-sized models of Victorian female prisoners! Venturing along the corridor that contained the original cells, it was unnerving to hear the ghostly cries and shouts of long-dead prisoners, even though we knew they were only sound effects. Some of the cells were ‘occupied’, and the fact that we were the only two visitors in the building added to the eerie atmosphere. As we stepped out of the side door, we were relieved to see other visitors were beginning to arrive, and as we were even more in need of caffeine we crossed over to the café in the Central Library. Down at the waterfront, the scene was as buzzing as it has been over the previous weekends; happy crowds enjoying themselves in the sunshine, street theatre, sea and air displays, the Sights and Sounds of India performing on the World Music Stage; in short, something for everyone. We couldn’t miss the opportunity of boarding the schooner Kathleen and May. Built by Ferguson and Baird at Connah’s Quay in 1900, this is the last remaining three-masted, wooden hull, topsail schooner. In 1961, The Duke of Edinburgh discovered her in a bad state of repair in Plymouth and this led him to set up the Maritime Trust in London. Kathleen and May was bought by the Trust in 1970 but when they failed to secure a £2 million National Lottery bid, she was eventually bought by businessman Steve Clarke and fully restored in 2000. As a result of his efforts in restoring the schooner, Mr Clarke was awarded the OBE in 2008. We were more than happy to give the £1 donation asked for in order to have a good look around this historic vessel. In contrast, we walked along to Princes Dock where the Celebrity Cruises’ INFINITY liner was berthed. Some of the passengers were disembarking as we passed and I felt proud of what the city had to offer those visitors as they stepped ashore. After a couple of hours, we found a quiet spot to enjoy our lunch – yes it is possible, if you know where to look – and after another caffeine boost (at the very attractive Bean coffee shop at Princes Dock) we made our way, footsore but with plenty to talk about, back to Lime Street Station.